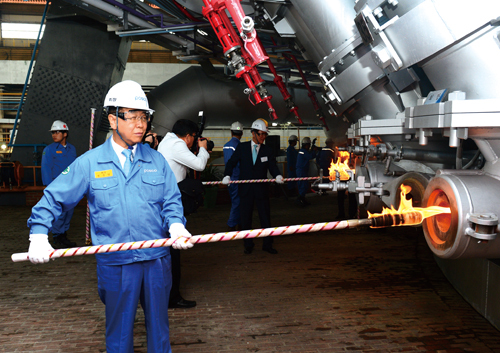 POSCO held a ceremony on June 7 to ignite a blast furnace at its Gwangyang Steel Complex in Gwan-gyang, South Jeolla Province, with some 6,000 of its executives and workers attending led by Chairman Chung Joon-yang. The No.1 blast furnace had its capacity expanded to as large as 6,000 cubic meters to be the largest blast furnace in the world, a dramatic increase from its previous 380 cubic-meter size, the steelmaker said June 7. The blast furnace is capable of turning out 5.65 million tons of steel ingot annually, which is enough to make 5.65 million cars, the steelmaker said. POSCO also won the selection as the world's top competitive steel maker by the World Steel Synamics(WSD) for fourth year in a row since 2010. WSD announced the POSCO’s selection at the 28th Steel Success Strategy held at Sheraton Times Square Hotel in New York on June 18. WSD said POSCO got 7.73 points out of 10 points in every area of the evaluation to win the top place, beating its rivals in such areas as the skills of its workforce, its Finex steel production facility, and the technologies for making steel products for energy facilities, among others, in the WSD evaluation of its operation structure. There are 21 blast furnaces with the capacity of more than 5,000 cubic meters in the world and the largest one before POSCO’s blast furnace was expanded was located at the Sagan Steel plant in China with a capacity of 5,800 cubic meters. POSCO has also joined the government drive to save electricity during summer months to overcome power shortage caused by the shutdowns of a number of nuclear power plants. The giant steel makers has decided to either stopping or lowering the operations of some of its electric furnaces in its Pohang and Gwangylang Steel Complexes. The Gwangyang No. 1 blast furnace was built in 1987 and produced 77 million tons of crude steel before it was shut down for repairs. POSCO officials said the blast furnace will increase the production of crude steel by 58 percent to rank number one in the world in terms of productivity and effectiveness. POSCO will also be able to boost its reputation as the steelmaker with the largest blast furnace in the world, playing a positive role in fueling local economic growth, the officials said. The blast furnace’s expansion work was finished on June 2, just four months from the start of its refurbishment, using all kinds of modern technologies available to expand its capacity. The officials said they installed equipment to prevent the production of moisture inside the furnace to improve the quality of the crude steel and also a facility to soak up waste gases from the furnace to make it environmentally friendly. However, steelmakers around the world are worried that an excess supply of crude steel would further worsen the world steel market that is already suffering from a supply glut. The supply of crude steel production in Korea alone expanded to 69 million tons annually now from 48 million tons in 2009, an increase of 21 million tons in the last three years. The large increase has been due to the launch of Hyundai Steel, a new steelmaker in Korea, along with the expansion of output among electric furnace steelmakers at the same time. The start of the No.1 blast furnace at POSCO’s Gwangyang Steel Complex has increased the steelmaker’s annual steel output to 30 million tons this year from 27 million tons by June of next year. In addition, POSCO will start the operation of its No.3 Finex steel production facility, adding 3 million tons of steel to its total steel production per year. Steel industry sources said they are afraid that the prices of steel products would go down further if POSCO keeps expanding its steel production output capacity while the world steel market has been faced with a glut as large steel consumer industries such as construction and shipbuilding face a slump. Furthermore, Hyundai Steel will make matters worse when its 3rd blast furnace goes on stream in September with the capacity to produce 4 million tons of crude steel annually. Electric furnace steel producers are expected to get hurt the most when Hyundai Steel starts operating its 3rd blast furnace. POSCO officials said they had to replace fireproof bricks inside the blast furnace and had to expand its steel production capacity to join the movement in the world steel industry to reduce the prices of their products, as an explanation for its reasons to expand the capacity of its No.1 blast furnace. POSCO has presented a plan to reduce electric power consumption in response to this summer’s electric power emergency state, leading efforts in electric power usage reduction to overcome the national power shortage.